What she saw at the murder scene might solve the case… if she can stay alive long enough to remember it. 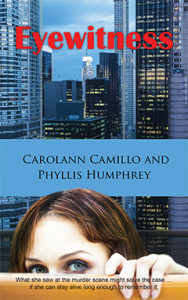 Eyewitness ($14.95, 258 pp., ISBN: 978-1-60381-355-6) is a woman-in-jeopardy mystery by Carolann Camillo and Phyllis Humphrey. A daytime TV star finds her life in danger after the photographer is killed during a photo shoot she cannot recall. 5 Cups of coffee: “Eyewitness is surely a page turner. The author keeps you guessing the who, what, where and why at every turn until the final act. The dirty dealings behind the scenes of soap opera life makes a great backdrop for this mystery. I loved the eclectic cast of characters. Mystery lovers will love this one.” Read more…. “From its vivid opening, ‘Eyewitness’ proceeds to grow as an intriguing mystery, with possible suspects turning up all over the place – and as far as the police are concerned, Toni is definitely one of them. Also, because of the character she portrays on the show, a lot of viewers blame her, too. A top criminal attorney, Michael Benedict, takes her case, and ends up protecting her physically as well as legally. The puzzles weave back and forth, through incidents on the set, her character’s storyline, the interactions between many of the show’s performers – and their off-screen family and friends. As the circumstances become more and more complicated, Michael and Toni predictably come closer together…. I liked getting to know Toni and Michael; the intrigue was nicely portrayed… and I enjoyed the final surprise. I recommend the book to most romantic murder mystery fans, and give it 4 stars.” Read more…. The big break Toni Abbott longed for has finally arrived. She has been cast as the soap opera villainess everyone loves to hate, and because of her, ratings are soaring. Then her lucky streak runs out. During a late-night photo session, Craig, the photographer, is shot to death. In the confusion Toni hits her head and is knocked unconscious, and when she awakes, she can’t recall what happened. If she could regain her memory, could she identify the killer? Apparently the killer thinks so, because soon after the incident, Toni hears someone breaking in to her apartment and barely escapes. Too bad the police believe she is somehow responsible for Craig’s murder. It doesn’t help that her character on the show is so convincingly nasty and conniving. Was the target really Craig, or did the killer aim for Toni and miss? Craig was an unscrupulous womanizer. Any number of people might have wanted him dead, including a career criminal he helped convict, his business partner, his wife, and his mistress. Despite her winning personality, Toni has her share of enemies, among them an older actress jealous of her success and the show’s director, whose animosity baffles her. With the help of Michael Benedict, a handsome young criminal lawyer, Toni sets out to awaken her dormant memory and unmask the killer. Meanwhile the character she plays, Alexandra, is in a coma, fighting for her life. The writers will decide Alexandra’s fate, but Toni must save herself. Carolann Camillo is an award winning romance and short story writer. A former New Yorker, she lives in the San Francisco Bay Area with her college professor husband and cat, Peaches. Her romantic suspense novel Forever Mine was published in September 2014. Click here to find her online. Phyllis Humphrey has sold 14 romance novels and several short stories. In 2002 she won the San Diego Book Award and was a finalist in St. Martin’s Press Malice Domestic Mystery Contest. Phyllis is a mother of four and lives with her husband in Southern California. Click here to find her online. She came out of the entryway and hurried into the kitchen. With Oscar at her heels, clamoring for attention, she put away the groceries. Ever since the summer hiatus ended, Beekman Place occupied most of her time. Her days were filled with traveling back and forth to the television studio, learning lines, and waiting endlessly for scenes, and she had little inclination to cook meals from scratch. They usually came prepared by someone else. All she had to do was pluck them out of the freezer compartment at Gristedes or pull them off a shelf. The cat turned his purr up to high speed. While she emptied a can of his favorite cat food into his bowl, he rubbed his head against her hand. “Don’t gobble. It’s bad for your digestion.” As he began to eat with relish, she watched him, enjoying the normal routine. At least that one small part of her life hadn’t changed. Slowly she began to unwind. Leaving Oscar to his supper, she went into the bedroom and pulled a floral-patterned cotton shift from the closet. She carried it and a change of underwear down the hallway to the bathroom. After removing her clothes, she turned on the shower and stepped under the spray. Warm water washed through her hair and cascaded down her face. Cleansing, soothing. She wouldn’t think. She’d let the nightmare fade: Craig, the show, the imminent demise of Alexandra Bradshaw that could send her back to making endless rounds of auditions. She turned off the water and stepped out of the shower. Where was that cat? Every night, after consuming his dinner, he took up a position on the blue throw rug outside the stall door of the shower. A long-standing ritual, never deviated from. “Oscar, I’m getting lonely,” she said in a singsong voice. After toweling dry, she slipped on her clothes and entered the hallway. The pale, filtered light no longer streamed onto the living room carpet. How odd. It lay dark and shadowed, as if night had fallen. When had she closed the shutters? Then she heard the cat, purring steadily. He was somewhere in the living room, going through his song and dance for attention. “I’m over here, Oscar, you fickle puss.” He was always under foot, unless someone else …. She froze. The thought turned her as cold and still as an ice sculpture. Pleading silently for the cat to come to her, she waited for what seemed like two lifetimes, but Oscar, purring contentedly, had transferred his affection elsewhere. Her heart slammed against her ribs, and her pulse thundered in her ears. She clamped a hand to her mouth to hold back the scream that built in her throat. Of all the horrors she might have imagined, this was the worst. Someone else was in her apartment.